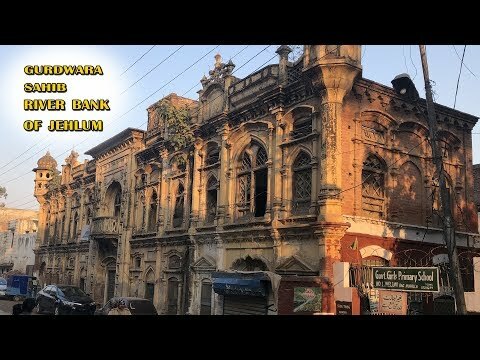 Jhelum is an ancient city with a number of historical sites which getting out of the site because of they have been neglected over the time and often left abandoned. The “Bhai Karam Singh Gurdawara” is one of those sites. The sacred site of Gurdwara Bhai Karam Singh is showing its splendour in the Bagh Muhalla, Jhleum on the river bank of River Jhelum. No exact date is mentioned when this Gurdawara was built, but the sign plates shows that it dates back to early 1920s. Earlier, It had only small piece of land; but gradually, with the mutual contributions of various people like Raies e Azam Lahore bawa Dinga Singh, Bhai Karam Singh Ahluwalia, an outstanding two floor Gurdawara was built. The most prominent name among all the contributors was Bhai Karam Singh Ahluwalia; that’s the reason it’s being associated with his name. According to the historian’s the expansions of Gurdawara took it 6 years from 1938 to 1944. Front door of the yellow colored building opens in North-West side; in a less crowded street of Bagh Muhalla. Unlike other Sikh Gurdawaras this exterior of this building does not have any minaret or arches. Entering the beautifully carved wooden front door you have Gurdawara has a big hall in its middle with a remainder of the foundation, which was possibly used to install holy Guru Garnath Sahib. Contradicting with this; some people have other opinions saying that it’s a remainder of the foundation of Palki and Guru Garnath Sahib was placed over it. There is a text written over it in “Gurmukhi” language. Text starts with the word, “Ik Onkar” which means God is one.rooms on your both sides.